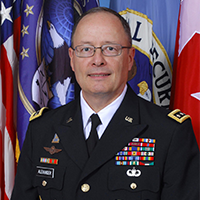 General Keith B. Alexander, USA, is the Commander, U.S. Cyber Command (USCYBERCOM) and Director, National Security Agency/Chief, Central Security Service (NSA/CSS), Fort George G. Meade, MD. As Commander, USCYBERCOM, he is responsible for planning, coordinating and conducting operations and defense of DoD computer networks as directed by USSTRATCOM. As the Director of NSA and Chief of CSS, he is responsible for a Department of Defense agency with national foreign intelligence, combat support, and U.S. national security information system protection responsibilities. NSA/CSS civilian and military personnel are stationed worldwide. GEN Alexander holds a Bachelor of Science degree from the U.S. Military Academy and a Master of Science degree in Business Administration from Boston University. He holds a Master of Science degree in Systems Technology (Electronic Warfare) and a Master of Science degree in Physics from the Naval Post Graduate School. He also holds a Master of Science degree in National Security Strategy from the National Defense University. His military education includes the Armor Officer Basic Course, the Military Intelligence Officer Advanced Course, the U.S. Army Command and General Staff College, and the National War College.